This review was written by one of our community members that participated in our run with Thorn Guitars. 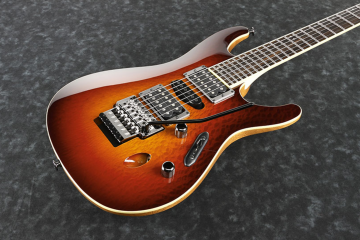 As fully authorized Thorn dealers, we can help you spec out and order your dream guitar here. Who are the folks behind Thorn Custom Guitars? Ron Thorn and his father initially started as Thorn Custom Inlays in 1993 and they soon secured themselves as Fender’s sole inlay artists. Ron still retains that position today! In fact, Thorn also does work for many other established brands. After receiving my Thorn, I felt obliged to write a Thorn guitar review as Ron delivered way ahead of schedule, and at a very reasonable price point. 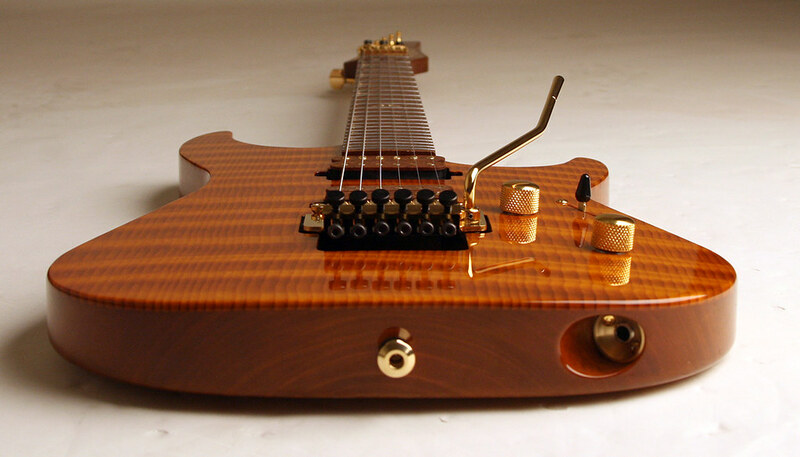 In the late 2000’s Thorn Custom Guitars was born with the Artisan series. The team today consists of six individuals including Ron Thorn. If you take a gander at the Thorn gallery you are going to notice a few things very quickly – each guitar is a one-of-a-kind show piece of exotic woods, intricate inlay work and stunning attention to detail. It is a truly incredible feeling when you unbox a new guitar for the first time. It is something that feels great every time it happens. That feeling becomes compounded when you’ve actually ordered yourself something fully custom and to your liking. You have no idea how everything is going to come together until you see your instrument in its complete form. You have a vision in your mind but there’s always that uncertainty of whether you made the right decision or not. But, even then… with the caliber of Thorn’s wood library, pictures do not do these guitars justice! When I opened the case up for the first time and let my eyes take in what was in front of me I knew for certain I made more than the right decision! Let’s just say I had a…raging thorner. Having already owned a Thorn telecaster and seeing the Wired Guitarist Rune run pop up, it was a no-brainer to pick one up. Going into the Thorn run I had a few ideas of what I might do depending on whether I opted to go with a carbon fiber top, some kind of natural top or even some solid body colors. I had not taken a look yet at the wood options available so I was definitely not going to settle on something right away. I’m not too big on bookmatched tops a lot of times so in the back of my mind I already knew that if I did go with some kind of top it would have to be a one piece. That being said, the choices from Thorn’s shop are so incredible that there were quite a few bookmatched tops I was debating going with! I knew one thing for certain. The neck was going to be roasted maple. The feel of a raw neck is my absolute favorite. 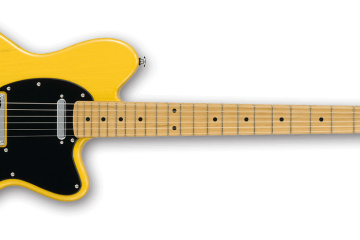 One of my favorite guitars that I’ve owned was a telecaster with a roasted maple neck. That neck really changed the standard for me. I’m not a big fan of the look of multi-ply necks so having something that is extremely stable and at the same time has a natural look and feel to it is perfection in my book. As far as body wood goes, mahogany was an easy choice for me. When I think about the types of guitars that I gravitate to tonally that I’ve owned, mahogany has been the consistent spec among them all. These include the Gibson SG ‘61, the Suhr Modern Satin and an Ibanez J-Custom 8527. The finish type I chose for this Thorn Rune was nitro. Why nitro ? Well, the idea behind the build after I picked my woods was to keep it pretty natural. I had asked Ron to explain the difference between going with a poly or lacquer finish. What attracted me to the nitro was that it would settle the pores of the wood. My SG had a nitro finish so I knew exactly what he meant and knew that was exactly the look I wanted. Another thing that I like about it is that since it is a thinner finish the body woods are able to resonate more freely. They aren’t constricted by a thick finish. This is what you hear guitarists refer to when they say the wood can breathe more. Now, this isn’t really going to affect the tone of the guitar that much as it is an electric guitar. But, when I feel an instrument resonating against my hand, forearm and body there is a connection formed and you start to become more at one with the instrument. You are able to feel the instrument speak to you on a subconscious level. This kind of sensation is what I find leads to inspiration. Here’s the low down on the guitar as we delve more in depth into how it actually performs! Let’s get the obvious out of the way and talk about how gorgeous this instrument turned out. If you’re in the market for a guitar built with exotic looking woods then Thorn Custom Guitars is definitely one of the shops that should be high on your list! When I was discussing options with Ron, one of the things he mentioned was to not let his options list hold me back. When I received pictures of the final photo shoot from Ron I really was not prepared for what I was in store for. When I opened up the case for the first time my eyes were quickly drawn to the unreal chatoyancy of the redwood and birdseye maple. When you look at the top from different angles it looks like hills rolling through the top. The birdseye maple neck has a rorschach like effect as the light dances through it at different angles. To be quite honest, it is a bit distracting to play until you get used to it. The inlay material I chose was mastodon ivory. Why ? Just so I could say it has mastodon ivory in it! I also felt like it would provide a nice contrast to the chocolaty neck while still looking warm and not too bright. The side dots are Luminlays. There is a tiny black outer border, with an inner ring of what looks like the mastodon ivory with the centre being the Luminlay material. Extremely nice attention to detail going on! Combine that with the hidden fret tangs and pristine fret work, you have a neck that looks like a work of art. Another aesthetic feature I requested was to have the pickup bobbins in matching roasted birdseye maple like the neck to bring some more cohesiveness between the neck and body. They look stunning! The pickups appear to be extremely well made as well which helps maintain that high level of consistency throughout the entire instrument. The finish work is beautiful. I couldn’t be happier with how the body was stained and finished. I asked for the mahogany body to match the redwood top and they did a wonderful job making it look stunning! The body was finished in nitrocellulose. After about a week or having the guitar the lacquer started to settle beautifully into the pores of the wood. I can’t wait to see what it will look like after 20 years. When you pick up this instrument and start playing it for the first time, something becomes pretty apparent right away. 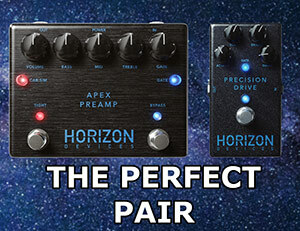 These guitars are a culmination of many decades of combined experience. When you pick up the guitar for the first time you can feel how well balanced it is. I like a guitar that weighs between 7 and 8 lbs as well. I’ve had lighter and heavier guitars and I find that weight to feel just right. The Thorn Rune comes in at 7.4 lbs. Perfect! The neck is really a work of art. Aside from the obviously gorgeous wood used. There are some great features you will find on Thorns that not only add to the beautiful aesthetic of the instrument but also add to the playability. The fretboard has rolled edges, and the frets are slotted so that the fret ends are hidden. This gives you an incredibly smooth feel when you run up and down the neck. 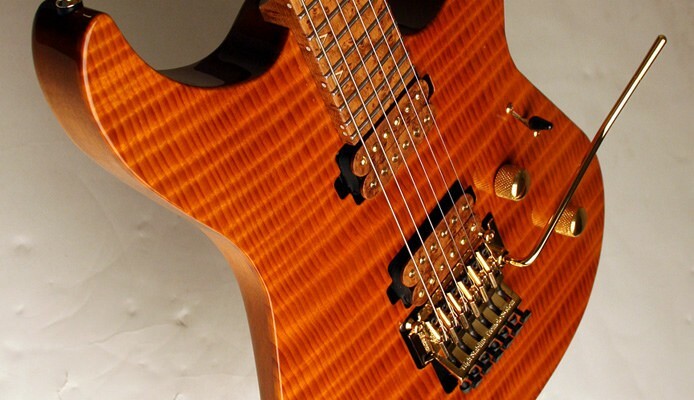 The neck heel is contoured similar to an AANJ on an Ibanez. It is carved very nicely and provides great comfort when reaching the upper register. You will find this neck heel standard on all of the Thorn’s with a bolt-on neck. They also feature a 2+2 ferrule and back-plate configuration which I think looks really good. Another great feature is the Precision Lock neck pocket design which provides an additional 8% of surface area contact between the neck and body over a traditional neck pocket route. There is a dove-tail lap joint that interlocks the body and neck and stainless steel machine screws are used to couple the neck to the body. There are stainless steel inserts installed under the fretboard and in the body for the screws to thread through and create a perfect marriage of the neck to body. This attention to detail during construction leads to an instrument that resonates and sustains beautifully! The frets are dressed to perfection. This being my second Thorn,I can tell you that the consistency between the two guitars in the fret work department is just unreal. These guitars are an example of what a fret job should be done like. No matter where you are on the neck, there is beautiful sustain. Every bend is clear, rings out true and never chokes out. I’m a really big fan of the tonal variety that comes from this set up. I always find a split bridge humbucker to sound pretty meh. So, having the option of going between both pickups together either split or humbucking is way better for me. Position 2 has a great tele-vibe happening as a result. The Gotoh floyd rose is a wonderful unit. I’ve been using Gotoh hardware for a while now I find the quality to be unsurpassed by any other company. 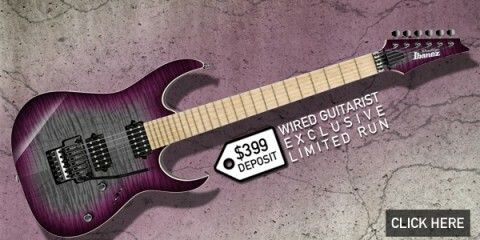 The floyd rose is no exception here. I have a guitar equipped with a Schaller and an RG550 with an original edge in fantastic condition to compare with. They all function extremely well. The thing I like about the Gotoh is that it is just a bit more comfortable if you happen to want to anchor your palm onto the bridge. The guitar is extremely stable. The guitar has had plenty of time to get acclimated and I have had zero issues with the neck moving on me. The setup from the factory is extremely well done. The guitar was perfectly in tune when I pulled it out of the case. Over the course of playing it for a couple weeks I’ve only had to tune up the high e string a few cents once. It is worth noting that the guitar was shipped to me from sunny California to Ontario, Canada, where it is quite cold. My current rig that I am running the guitar through is a EVH 5153 50-watt with the matching 2×12 EVH Cabinet. I’ve had the amp for about two years and still on the original tubes so I’ve had plenty of time to figure out how to dial it in. I don’t use a noise gate at all as I’ve never liked how they interfere with the natural feel of the amp and get in the way of having smooth note decay which I am a big fan of. I also have an original 60s vintage Blackface Fender Super Reverb 4×10. When Ron and I were discussing the specs of the guitar over the phone I was still undecided as to what I wanted to do in terms of pickups. He had mentioned that he was going to be designing a set for the Rune so that actually peaked my interest. I decided to trust that Ron wouldn’t put anything sub-par into one of his creations and went with the pickups he was going to design. I am really glad that I did. The Alonzo Guitars set really compliments this instrument extremely well. 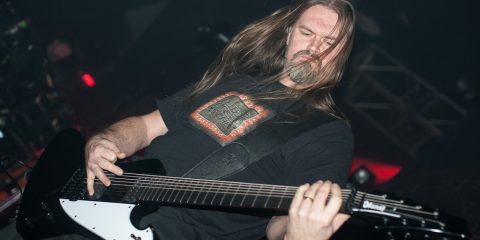 I’m typically a the ran of PAF-style pickups when it comes to humbuckers. I feel like for playing rhythm especially when you tune lower they provide excellent string clarity and note separation. I’m also a fan of using lower resistance pickups when going into the Red Channel on the EVH. This channel is already more compressed so it’s nice to retain some headroom for a bit more control over the gain. This allows me to clean up my signal pretty nicely when I roll off the volume and pick lighter when I want to move into a calmer section. Dynamics are a big part of creating emotion in music I find so my approach is to always be able to retain some level of control over my tone. I really like how the neck pickup is voiced as well. It doesn’t get too “bluesy” sounding. 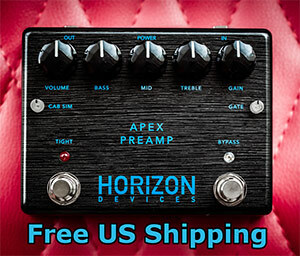 It has a very nice and warm sound while retaining a very even tone. Sometimes a neck pickup sounds too much like a neck pickup I find. But, the fantastic thing about how the 5-way is wired up is when you pop the guitar into position 2, you get that blues-like tone. Roll off the tone knob a bit to let the mids shine through more and you start to hit country territory! Although, if really want that blues-like neck tone, position 4 with the VHT5 split nails it. There’s a lot of ground that you can cover with this guitar and a versatile amp like the EVH 5153 series. The bridge pickup is a real winner in this guitar. I find it to be really responsive when playing lead. They are really clear and defined. A problem that I find when you get a really hot bridge pickup is that they have a tendency to sound thin for rhythm playing. They respond really great for lead work and make it easier to hit your pinch harmonics but it comes with that trade off. These pickups aren’t too hot so they retain a really nice and chunky rhythm tone. I like to use a Way Huge Green Rhino Mk2 on the Red Channel when I want to push my tone as heavy as I like it to be. It lets you dial in some low-end back in that is typically cut out with a tubescreamer and lets you get those crushing, chest pounding palm mutes with these pickups. It’s a pretty visceral experience when you wear your musicians plugs (protecting your hearing is important!) and crank your amp to bone crushing volumes. When you feel the instrument resonate against your body, the speakers vibrating every molecule in your body, hair flowing from the sheer force of the sound waves passing by you enter another realm. All your worries disappear and you know that you have made one of the best decisions in your life, despite what your neighbours might think. It is hard not to recommend buying a guitar from Thorn Custom Guitars. When you consider all the factors: price point, options, consistency and turn around time. It really becomes a no-brainer that this shop should be high on your list of considerations. There is a lot of passion being put into these guitars that oozes through your pores and into your inner being when you play one of these fine instruments. This guitar is a keeper for me. I think everyone who ordered one of the guitars from the Thorn Guitars Wired Guitarist run is going to be extremely impressed with what they get. I know I am! This review was written by Nick Slusarczyk of Waterloo, Ontario.